This is a monotypic genus (i.e. has only one species), represented by Hayhurstia atriplicis (Linnaeus). 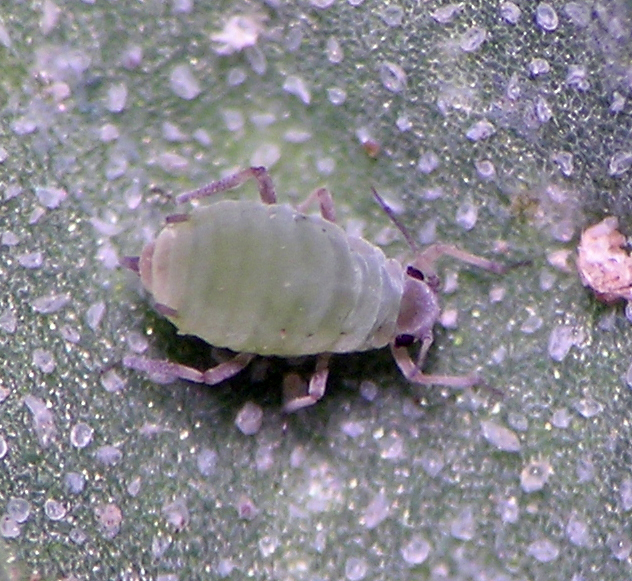 According to previous accounts, this species lives inside pseudogalls on leaves of its Amaranthaceae hosts, but I often find it living freely on the leaves without any leaf deformation. It can be extremely abundant in agricultural landscapes because common weeds such as Chenopodium album (lambsquarters) are excellent hosts. It is widespread in the Northern Hemisphere plus Africa and Central America. I have material from Washington, Oregon, Idaho, New Mexico, and Germany. The oviparous female of Hayhurstia atriplicis.